A large sized bead frame table for toddlers and is our best selling traditional wooden toy. City Beads is based on transportation in the city including a train, car, plane and helicopter that will go through the tunnel. Built on a raised platform and tilts at any angle to make play more enjoyable. The table has a rise-up platform which allows kids to place their legs underneath and also stand up and play in a group with friends. 3 great wire frames - planes, helicopters and trains. Wooden turning clock - great for learning how to tell the time. 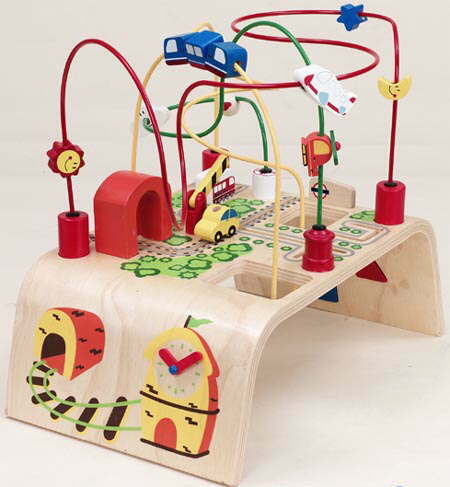 A great educational wooden toy. We know your kids will love this City Beads Activity table.